This page is about the medium tank M1A1 Abrams. For other uses, see M1 (Family). The Tank, Combat, Full Tracked, 120-mm Gun M1A1 (shortened to M1A1 Abrams) is a rank VII American medium tank with a battle rating of 10.0 (AB/RB/SB). It was introduced in Update 1.87 "Locked On". Write about the mobility of the ground vehicle. Estimate the specific power and manoeuvrability, as well as the maximum speed forward and backward. Reload time slower than 105mm armed predecessors. Almost as soon as the first production M1 Abrams MBTs began rolling off the assembly line, did American engineers begin working on an upgunned version of the Abrams. They succeeded in this endeavour in 1981, after a prototype Abrams, designated M1E1, was successfully fitted with a 120mm Rheinmetall smoothbore cannon. Showing promising performance, work on the vehicle continued. 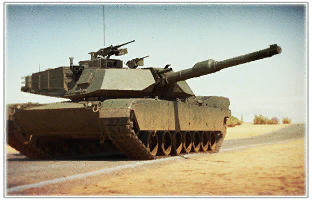 At the same time, an upgraded version of the original Abrams, the IPM1, which featured improved protection and a larger turret was briefly produced between 1984 - 1986. 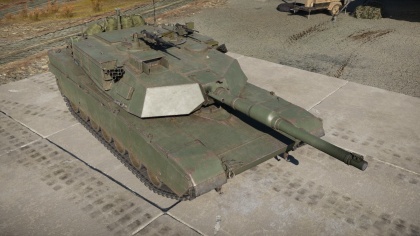 The resulting M1A1 Abrams inherited the upgrades from the IPM1 and combined them with the M256 120mm smoothbore cannon, a licence-built version of the German original. The M1A1 was adopted for service in 1984, and was produced alongside the IPM1 for a short while since 1985 until the older modification was phased out of production. The M1A1 saw its first use during the U.S. deployment in the Gulf War in 1991. Faced against arguably inferior Soviet-era tanks, the M1A1 had successfully proven its worth in tank-on-tank engagements, but exposed new problems concerning its performance and vulnerability in urban environments. This led to further upgrades for the vehicle being developed later on. Production of the M1A1 seized in 1992, with over 5,800 units being produced, including Egyptian and Australian export models. The original M1A1 chassis still serves today, albeit as upgraded variants which have undergone several modernization efforts. This page was last edited on 9 April 2019, at 07:29.